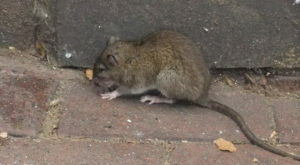 Populations of Rats have grown rapidly over the past few years in Peterborough and the surrounding areas. They are highly intelligent creatures, potentially requiring multiple techniques in order to eliminate them from your property. If rats have started to move into your home or business, please give us a call to discuss treatment options, before they infest! Once rats have entered your home, they can cause significant damage to your property. 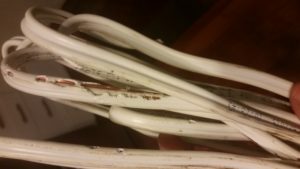 They will chew through electrical wires, wood, drywall, and in some cases even concrete. If you notice any signs of rats around your home, cottage, or business, please call a professional before any further damage is caused to your property! such as wood or drywall? Have you noticed damaged food packages? This could mean that you have a rodent sharing your living space. Other signs include urine and droppings, tracks on dusty surfaces, and burrows or holes in and around foundation walls. Norway rats are prolific breeders, so it’s important to tackle these invaders right away to avoid a severe infestation and further damage to your home. How fast can rats infest? From breeding to birth takes around 22 days. Each female has the potential to birth 6-10 pups. On average they breed up to 4-7 times per year. It only takes 2-3 months for a female rat to reach sexual maturity and start producing a new litter. They are prolific breeders and can quickly infest a structure in less then 1 year. If gone unchecked, they can quickly move into your living space and cause potential health risks. Andy’s Pest Control services all of Peterborough and Kawartha lakes including Bancroft, and Aspley.